This is a true story of Roxie, the min pin rescue dog. Read her story and find out how it ended. 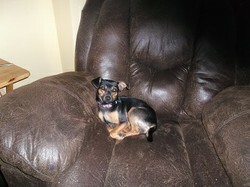 Roxie, a little min pin was seen running around for three days. Nobody bothered to knock on doors looking for her. Those who discovered her, could not keep her, but didn't want to put her in a dog shelter. This is the story of how Roxie, the little min pin, became a dog that needed to be rescued and her journey. Find out what happened to Roxie. After having my wonderful rescue dog that nobody wanted, Stephanie for 8 years, and having to have her euthanized, I absolutely did not want another dog. I wasn't exactly without any pets after losing my Stephanie because I still had my cat and bird. However, 2 years later my phone rang. That phone call affected my life once again. My step-mother called me to tell me that the neighbor of a family member had a little dog that they had been trying to catch for 3 days. She hung around with the dogs outside while they continued to feed her. Nobody wanted to see her go to the shelter. I already knew what was going to happen if I went to see this dog, but I got up and went. Needless to say, I didn't come home that night empty handed. Roxie the Min Pin Rescue was in my arms. However, I was not planning on keeping this little dog. I contacted the local vet, the SPCA, and even placed ads on the local radio station and newspaper in an effort to find the owner whom I thought was surely missing her. After speaking to the dog warden about her, the consensus was that this little girl had been dumped on the side of the road. So, now what was I going to do with her. The shelter idea was out! So, I made an appt and took her to the vet. She was updated on her shots and given a comprehensive examination. I named this little girl “Roxie.” The vet informed me that she was only 6 months old and a min pin. I have never had a min pin, which is another name for miniature pinscher, before and had no idea as to what a min pin would be like. Roxie taught me well. A min pin is shortened name of a miniature pinscher, but these dogs are not related to the Doberman Pinscher at all. They are small dogs with an average weight of 11 pounds. They are full of energy, but they have a few traits which can drive you crazy. They are stubborn, even though they are very intelligent. Roxie introduced me to the min pin stubbornness. I kept her for 5 months, but could not housebreak her. I am still finding spots where she went pee pee on the floor. One of the first lessons that Roxie taught me was that these little dogs are not only stubborn, but they are great escape artists. They can get out of a collar and run off before you even realize it. They don't come back when called, until they are good and ready to come back. This is their nature. They were bred to be small hunting dogs. These dogs have a tendency to develop small trachea's which makes the wearing of a collar not to be a good idea. A tight collar, and having these small dogs tug, pulling the collar against their throat can also cause the trachea to collapse which can result in difficulty breathing, a lot of coughing, and possibly the need for expensive surgery that is not without problems. The best thing for min pins, and other little dogs which can also develop a collapsed trach should wear a dog harness/halter. A harness/halter is not meant to be worn constantly like a collar. They can actually break a bone should they get a leg caught up in them. Don't let your dog become a statistic. These harnesses are not hard on the dog, and they don't choke them. Be sure to measure your dog for the right size. If you come close to being on the high end when you measure your dog, you may be better off getting the bigger size. My 11 pound min pin who was small in build did well with a small harness. However, I now have another min pin with a wider body, 11 pounds that needs a medium size harness. Although attached to her, even though it broke my heart, I began a search for another home for Roxie. Fortunately I found the perfect home. Her new family drove 6 hours, in a snow storm, to my home. At first, Roxie was upset, but once I handed her over to Stacie and asked Stacie and her husband to go to the living room with her just to see what she would do. Roxie jumped all over the two of them, giving them plenty of kisses. She acted like she had known them forever, and was happy to see them again. I knew I found the right family for her. I have cried many days over Roxie. However, the housebreaking problem was a huge issue with me. But, in her new home, she has a min pin to play with, a pug to sleep with, and an older lab for company, along with a family that spoils her to death. She now has a fenced yard, and a swimming pool where she can swim with Stacie. Stacie has been lucky with Roxie. She has had a few accidents, but she has learned to go do her business outside with the other dogs. Of course, she taught Zoey, the other miniature pinscher, how to use the house and furniture for a race track. I don’t understand why people think if they drop a dog on the side of the road, where there are houses, that somebody will take them in. Often they say they do this because they will die if left at a shelter if they are not adopted. What do they think will happen to these babies when they are dumped and left to fend for themselves? Roxie was lucky! First she was a min pin rescue that was cared for until a great home was found for her. Not many dogs are this lucky! There are a lot of things you will need when you bring your new fur baby into your home. Here are some ideas for what is needed. They make great dog gifts too. It was hard to give her up. I love stories about dogs, because I love dogs. MinPins are just the cutest little things, and I'm so glad you found a good home for her. I know it must have been hard for you. Lovely story I thoroughly enjoyed. People are doing just that. They will tie them to a tree, dump them on a highway, throw them out windows, it is sickening. Some will move and leave the pet behind. The things people are doing to unwanted animals today is sickening. Roxie was one of the lucky ones. I have many relatives who live on Cape Cod, which is a tourist place where people spend the summer. I've heard they get a pet for the summer and then abandon it when they go home. I cannot understand how people can dump puppies and think they will somehow survive. Fortunately Roxie was saved but it need not be the case with all the abandoned pups. Loved the cute little small dog and your tips on how to take care of the miniature pin breeds.